The main difference between PROM EPROM and EEPROM is that PROM is programmable only once while EPROM is reprogrammable using ultraviolet light and EPROM is reprogrammable using an electric charge. ROM, which stands for Read Only Memory, stores the instructions required to start a computer. It is a nonvolatile memory. Therefore, the data remains even when there is no continuous power flow. In other words, the data is permanent. PROM, EPROM and EEPROM are some types of ROM. PROM stands for Programmable Read Only Memory. It is a computer memory chip, and it is possible to program it once after creation. After programming the PROM, the information we write to it becomes permanent. Therefore, we cannot erase or delete that written data. 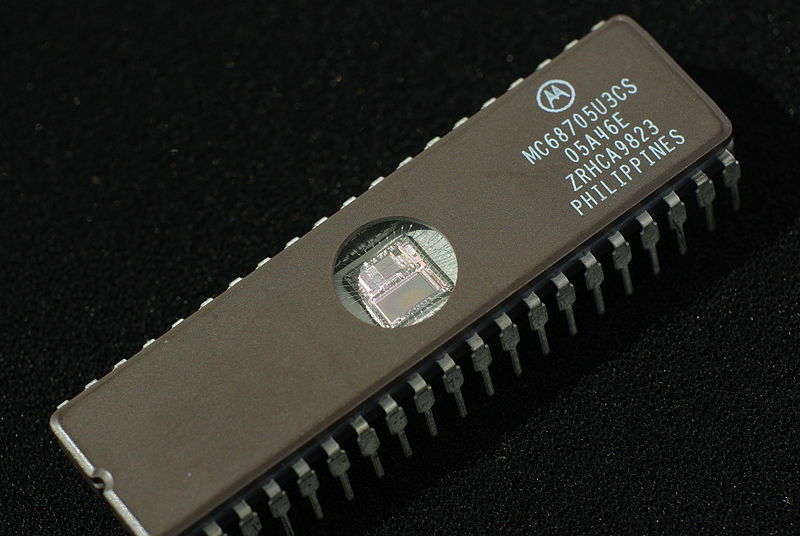 The PROM chip was commonly used in earlier computers’ BIOS systems. After creating PROM, all the bits are ‘1’. If a certain bit should be 0, we can make that 0 by burning. One major drawback of PROM is that it is not possible to update it. In other words, we cannot reprogram it. Instead, we have to discard that and replace it with a new chip. EPROM stands for Erasable Programmable Read Only Memory. 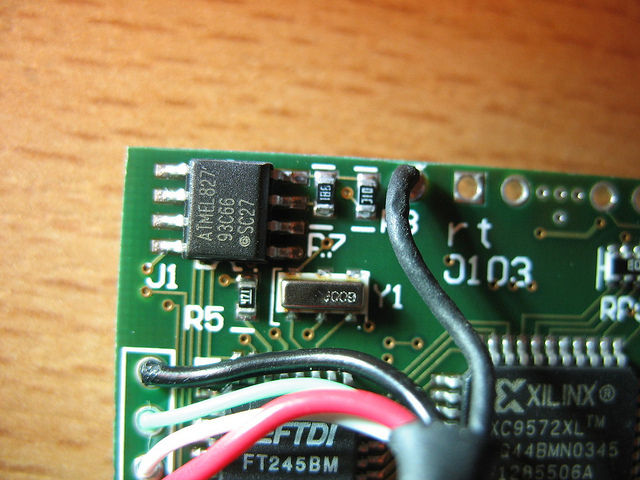 We can erase and reprogram an EPROM without replacing it. It is possible to erase and write to it by exposing the memory chip to ultraviolet light. Moreover, it is easier to recognize EPROM via transparent fused quartz window in the top of the package. EPROM is used more commonly than PROM because it allows the manufacturers to modify or reprogram the chip. EEPROM stands for Electrically Erasable Programmable Read-Only Memory. It is a memory chip that we can erase and reprogram using electrical charge. It consists of a collection of floating gate transistors. The flash memory is a type of EEPROM which has a higher density and lower number of write cycles. EEPROM is a replacement of both PROM and EPROM. It is used in many applications including computers, microcontrollers, smart cards, etc. to store data, erase and to reprogram. PROM is a Read Only Memory (ROM) that can be modified only once by a user while EPROM is a programmable ROM that can be erased and reused. EEPROM, on the other hand, is a user-modifiable ROM that can be erased and reprogrammed repeatedly through a normal electrical voltage. Thus, this is the main difference between PROM EPROM and EEPROM. PROM stands for Programmable Read Only Memory while EPROM stands for Erasable Programmable Read Only Memory, and EEPROM stands for Electrically Erasable Programmable Read-Only Memory. 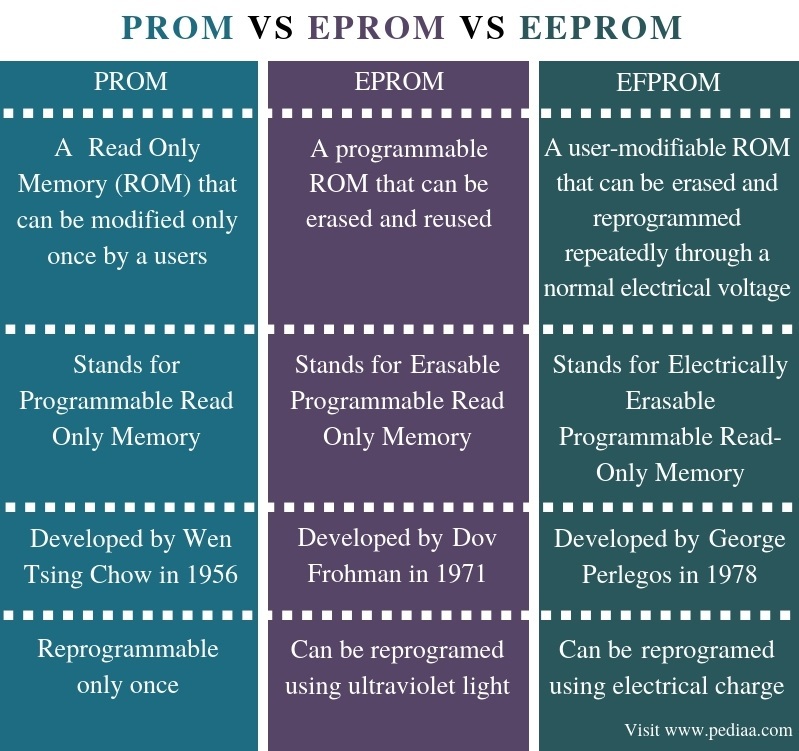 Wen Tsing Chow developed PROM in 1956; Dov Frohman developed EPROM in 1971; George Perlegos developed EEPROM in 1978. Furthermore, functionality of these ROMs is a major difference between PROM EPROM and EEPROM. We can reprogram PROM only once. However, we can reprogram EPROM using ultraviolet light, and we can reprogram EEPROM using electrical charge. PROM, EPROM, and EEPROM are three types of ROM. The difference between PROM EPROM and EEPROM is that PROM is programmable only once while EPROM is reprogrammable using ultraviolet light and EPROM is reprogrammable using an electric charge. In brief, EEPROM is commonly used than PROM and EPROM. 1. “What Is PROM (Programmable ROM)?” Computer Hope, 13 Nov. 2018, Available here. 2. “What Is EPROM (Erasable Programmable Read-Only Memory)?” Computer Hope, 13 Nov. 2018, Available here. 3. “What Is EEPROM (Electrically Erasable Programmable Read-Only Memory)?” Computer Hope, 26 Apr. 2017, Available here. 4. “What Is Programmable Read-Only Memory (PROM)? – Definition from WhatIs.com.” WhatIs.com, Available here. 5. “What Is EPROM? – Definition from WhatIs.com.” WhatIs.com, Available here. 6. “What Is EEPROM (Electrically Erasable Programmable Read-Only Memory)? – Definition from WhatIs.com.” WhatIs.com, Available here. 7. “EEPROM.” Wikipedia, Wikimedia Foundation, 6 Jan. 2019, Available here.